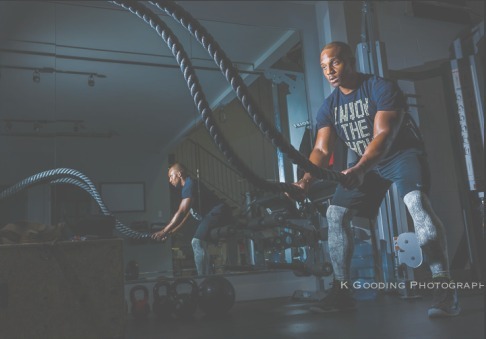 Kareem business is also his passion – he is an energetic, and a devoted coach committed to promoting healthy, active living to the West Island community, regardless of the persons age or current activity level. As an ambassador of change, Kareem definitely puts the “personal” in personal training by focusing his efforts on helping anyone and everyone desiring to change their lives by finding their FITT, to live a happy and healthy lifestyle, individually or as a group. Kareem is continually building on his knowledge base to help his clients get on the road to healthy lifestyle. The mantra of the FITTNation world is that change is possible, not just for the short-term, but for the long-term. You can get more details on Kareem on his website. When did your start working out?I’ve been an athlete from as long as I can remember. I ran track in elementary and high school, I also played basketball, soccer, and football. Despite being very active in sports, I only really began training at the age of16. What adversity have you had to overcome as athlete?I’ve experienced a number of injuries to my knees and hips as a result of wear and tear. This has been mentally taxing,”Your mind wants to go but your body says no. Developing mental toughness has been a huge plus in my life. How has working out impacted your life?In more ways than one for sure. Exercising became a gateway for me to decompress, relax and be relieve myself of anxiety and stress. Training has improved my posture, my conditioning, as well as my confidence. Being overweight when I was younger, my self confidence and esteem were very low and created a short-lived period of depression. Exercise and corrections to my relationship with food, changed my body and my mind, everything improved. Now, as a trainer, I am able to understand just what my clients are going through and I’m able to show empathy which helps me to connect with them on a greater level. As a result, they trust the process I put them through and they too experience improved posture, conditioning, and self-confidence. How often do you train and for how long?My work schedule is pretty busy, so I make time between my clients and classes to get in a solid workout. Lately, I have been off of the weights and working on strengthening and stabilizing my body through callisthenics. A typical training session lasts anywhere between 45 and 60 minutes, including warm up, cardio, and cool down. I used to be in the gym for almost 90 minutes but found that my momentum would dip. Keeping it short and a little faster with less rest time in between has proven to be more beneficial for me and I have the results to show for it. What are some keys to working out intensely and avoiding injury?Adequate stretching is very important. This is a step I used to skip but since starting my callisthenics program, I spend at least 15 minutes stretching everything to make sure my joints are prepared for the load. Breathing is also very important! Holding your breath will only lead to trouble. Exhale, exhale, exhale – even if it’s exaggerated! Ensuring that your rest period is used effectively is also important. Stay loose, keep the body moving! And most importantly – DO NOT QUIT! Higher intensity workouts may lead you to the path of giving up but you don’t have to. Simply slow down, compose yourself, and then continue when ready to push again. What is your #1 fitness tip?Train with a purpose. Set a goal, raise the bar and then raise it again. If your workout has no target, you will feel aimless. It could be the number of reps you want to hit or sets – anything! Just giving yourself a goal will increase you level of accomplishment and focus. Lorne’s take – Kareem has some terrific insights on the importance or stretching and breathing. I also really like what he has to say about training with purpose and focus.